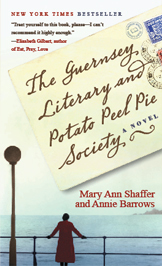 The Guernsey Literary and Potato Peel Pie Society » Week 5 Essay Winner Is Up! « Essay Winner – Week 4! Ahhhh…I am home! Reading to me has always been an experience that transports me to another place and time, the one that can only exist in the dusty-smelling, page-fluttering world in my fingertips. With each new adventure I long to skip ahead, see what will await me just around the corner…but I resist! Why spoil the excitement that will only be that much sweeter when it finally unfurls at the end of the road? My favorite land to visit above all others lies within the pages of Little Women. While I, personally, have no sisters to speak of I do when I open this book. I find myself sitting alongside Joe, Meg, Beth and Amy in their attic as they rehearse a new play, laughing along as each takes their part. I am hiding just behind them while Joe inevitably breaks poor Laurie’s heart, tears spilling from my eyes, impeding my view of them. And, of course, I weep and mourn along with my literary family, kneeling by Beth’s bed (how will my tears ever dry on her blanket) as she passes. I first discovered Little Women in my early teen years and am amazed at how my views of the book and its topics change as I age and mature along with the characters. As a young woman reading the story I was entranced by the joy the sister’s brought to each other and longed for a sister of my own. I didn’t read into the underlying storylines of war, self exploration, love that reached past one’s familial bounds. As I grew, always coming back to this favorite world every few years, I delved deeper into the fear this family felt as their father was away at war. We all new, us sisters, that horrible things were lurking just around the bend and that father was there, risking his life, for us all. As I fell in love and, as we all do, had my heart broken, I was able to feel Laurie’s heartbreak as well and Joe’s pain for hurting Laurie, her trusted friend. While writing my own papers for college I could actually feel the joy and excitement, always mixed with a tinge of apprehension and self doubt, as Joe made her way to New York and learned to grow on her own, away from (insert name of home). In the end, whenever I again have read that last page and, reluctantly, closed the book and put it back on my shelf, the story stays with me. What would my sisters do in this situation? Well, let’s ask! I guess I will have to open that book up again after all. This entry was posted on Wednesday, October 7th, 2009 at 2:38 pm	and is filed under Uncategorized. You can follow any responses to this entry through the RSS 2.0 feed. You can leave a response, or trackback from your own site. Once again I have been invited to attend a Book Club . They are reading the The “Guernsey Book” . I am from Jersey, the larger island , all forty-five square miles of it. I was in Jersey all through the Occupation July1 1940- May 9 1945. I am delighted to attend these meetings. I also loved the book. The German’s forbade any contact with Guernsey during those years. We were totally isolated BUT the school cildren in Jersey were not deported to England. I live in Arizona and would welcome any enquiries. ????????? 2 ???????? 2008 « ????? ? S.T.A.L.K.E.R…. Withal, it should be borne in head that and talk to a leg handler….